This is an epic tale of family, love, and politics spanning the twentieth century, told with humour, tenderness and insight by one of Britain's most promising young writers. It is shortlisted for the Costa First Novel Award and longlisted for the Desmond Elliott Prize. If you've approached Bains Stores recently, you'd be forgiven for hesitating on doing so. A prominent window advert for a discontinued chocolate bar suggests the shop may have closed in 1994. The security shutters are stuck a quarter-open, adding to the general air of dilapidation. A push or kick of the door triggers something which is more grating car alarm than charming shop bell. To Arjan Banga, returning to the Black Country after the unexpected death of his father, his family's corner shop represents everything he has tried to leave behind - a lethargic pace of life, insular rituals and ways of thinking. 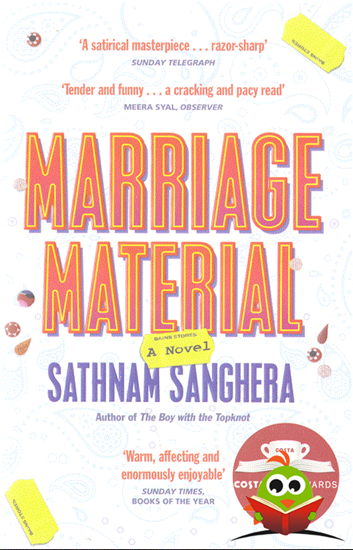 But when his mother insists on keeping the shop open, he finds himself being dragged back, forced into big decisions about his imminent marriage back in London and uncovering the history of his broken family - the elopement and mixed-race marriage of his aunt Surinder, the betrayals and loyalties, loves and regrets that have played out in the shop over more than fifty years. Taking inspiration from Arnold Bennett's classic novel The Old Wives' Tale, Marriage Material tells the story of three generations of a family through the prism of a Wolverhampton corner shop - itself a microcosm of the South Asian experience in the country: a symbol of independence and integration, but also of darker realities. This is an epic tale of family, love, and politics, spanning the second half of the twentieth century, and the start of the twenty-first. Told with humour, tenderness and insight, it manages to be both a unique and urgent survey of modern Britain by one of Britain's most promising young writers, and an ingenious reimagining of a classic work of fiction.